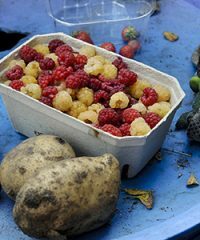 The word 'permaculture' comes from 'permanent agriculture' and 'permanent culture' - it is about living lightly on the planet, and making sure that we can sustain human activities for many generations to come, in harmony with nature. One of the founders of the Transition movement, Rob Hopkins, was a permaculture educator in Kinsale, Ireland. In 2004, he asked his students to redesign the community for peak-oil, and an Energy Descent Action Plan was the result. When Rob returned to Totnes, Devon, he and Naresh Giangrande developed the Transition movement as a result of this experience and learning. Totnes became the first transition Town in 2006. Permaculture is the design process which was used to generate that initial energy descent action plan. Permaculture design helps with designing intelligent systems which meet human needs whilst enhancing biodiversity, reducing our impact on the planet, and creating a fairer world for us all. People across the globe are transforming their communities with permaculture. 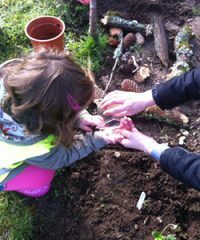 Permaculture combines three key aspects: 1. an ethical framework 2. an understanding of how nature works, and 3. a design approach These are combined to support the creation of sustainable, productive, non-polluting and healthy places to live and work – all aspirations shared by the Transition movement. For more information visit the Permaculture Association website. 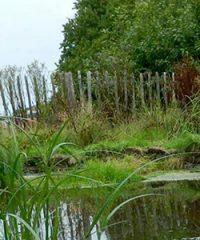 Slades Farm Community Garden grows fruits and vegetables and other useful plants within a tranquil 2 acre wildlife haven.